What's Really Happening in Jurassic World 2? It's been a big day for Jurassic World: Fallen Kingdom, as we got our first look at the new dinosaur Baronyx along with a video promoting the long-awaited release of the first trailer, which is slated to debut on Thursday, December 7. 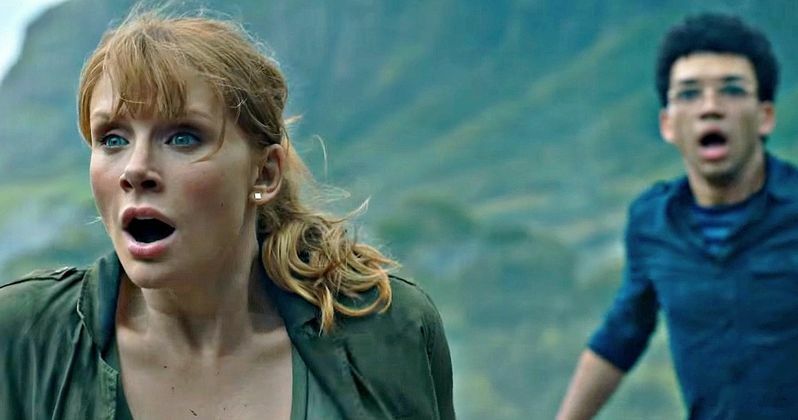 While we wait for this trailer launch, actress Bryce Dallas Howard revealed new details about her character Claire Dearing, and what she's been up to since the events of Jurassic World, both personally and professionally. Here's what she had to say below. "Claire's founded an organization, Dinosaur Protection Group, and they're finding a way to get these dinosaurs off the island. She reaches out to Owen Grady to let him know this is happening." The story returns to Isla Nublar where a volcano threatens to wipe out all of these dinosaurs, which has led to Claire teaming up with Owen again. This is certainly much different than the corporate leader Claire Dearing we saw in the first movie, with Bryce Dallas Howard revealing in a January 2016 interview that the sequel will feature a "very different" Claire. The actress' statement is rather interesting in another way, since it seemed that they were on their way to a burgeoning romantic relationship at the end of Jurassic World. If they were still in any sort of romantic relationship, she naturally wouldn't need to "reach out," but she wouldn't offer any further details about what happened, although she revealed that fans will find out what happened right away. "When you see them at the beginning of this story, you get caught up as to what's going on. But it's not what you would necessarily expect." This report adds that new cast members like Daniela Pineda and Justice Smith play characters who have connections to Claire's new Dinosaur Protection Group. Jurassic fans were quite thrilled when it was confirmed that Jeff Goldblum's Ian Malcolm will return from the original Jurassic Park, and his return was also thrilling for director J.A. Bayona as well. Here's what the director had to say about getting to direct Jeff Goldblum. There was also a humorous new Jurassic World 2 video where Chris Pratt and Bryce Dallas Howard team up with YouTube star Zach King as they get ready for the highly-anticipated trailer for Jurassic World: Fallen Kingdom. Entertainment Weekly broke these new details, and as we wait for the first trailer to arrive on Thursday, it remains to be seen if more will be revealed between now and then.